Do the Powers Make the Hero? Due to the numerous ways extraordinary faculties can be introduced into a tale, there are several conditions that an author must consider when creating powered protagonists. In today’s post, we are focusing on the most important one: whether or not strange abilities make the lead character a hero. Is it his special powers that make the sci-fi/fantasy protagonist a champion? Or are the forces that he wields less important than the character himself? The answer to the first question should be no, because a protagonist who is only memorable for his special talents or whizz-bang gadgets is not a character. He is, rather, a prop; a device that demonstrates the author’s cool ideas in a series of happy (or unhappy) accidents. No one enjoys watching a prop being moved around the stage by the play’s director, even if he is honestly trying to save the show. They will feel sympathy for him, but nothing else. In the same manner, no one will respect or admire a writer who cannot create characters who are alive. In order to illustrate this fact, let us compare Star Wars: The Last Jedi and Thor: The Dark World, which each have Rey and Thor as the respective lead characters. In the sequel Star Wars films Rey commands nearly cosmic Force powers; she can use the Force with almost no training whatsoever. Thor, on the other hand, is – well, the god of thunder. He can raise storms at will, he is the strongest Asgardian still living, he can survive explosive decompression and hard vacuum, and he is relatively indestructible. 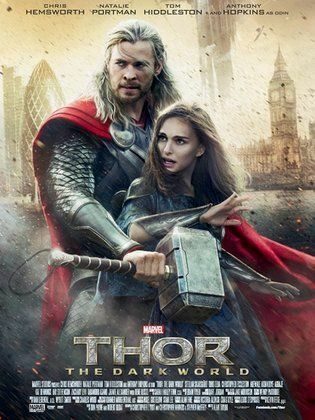 As a side note, I really love this poster of Thor: the Dark World. It really captures the sense of the heroism and adventure that Thor ought to be about. This entry was posted in Links, On Writing and tagged Sharing a link, Writing by DBreitenbeck. Bookmark the permalink.